Basically, you’re here to find out what to do to increase visitors to your website, rank higher on Google and other search engines and ultimately make more money online from brands and agencies wanting to work with you right? Right. So that’s exactly what we’re going to do today. Before we start though, let’s just keep in mind what I’m going to tell you takes commitment and time. If you’re a new blogger the best time is now to start implementing these tricks. If you’ve been blogging a while, the best time to start implementing these tricks was yesterday. In all seriousness though, I highly recommend taking time to go back over every single post you’ve ever published, even if you set aside time every day or weekly to audit your site initially and then keep on top of it weekly/monthly this will make such a huge improvement to your traffic and SEO ranking. If you have less than 800 published articles on your site, lucky you. For me, I’ve spent the last few months completely immersed in auditing every single post (and page), it has I can report made a huge improvement to my traffic already. Let’s get onto it though. Here’s how to rank higher on search engines and get more traffic to your blog. This is probably the broadest topic to cover. I’m going to take you through the best way to SEO each post. We’ll take this post you’re reading that needs a little reworking and audited. If you’re on WordPress and you’re not using Yoast, why the hell not?! Download it now as it’ll make your life so much easier and your site more discoverable. I hear a lot of people saying they use Yoast but most of the time their posts are amber. And then you wonder why I roll my eyes when you say ‘I wish I could blog full-time’. Do it properly or not at all. You see, yes you want to write for your reader. This is so important. However, you also need to publish posts that search engines find attractive too. So work on a balance of making your readability great for both SEO and your audience. Make the readability green always before you publish anything. 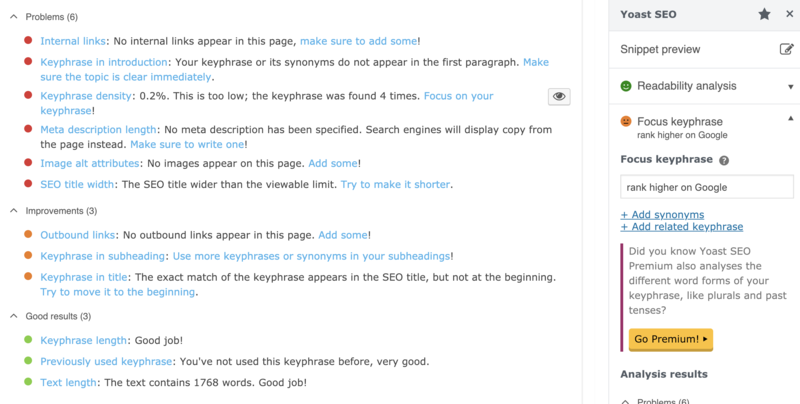 Insert a keyword to get the SEO score green too. Your keyword doesn’t necessarily have to be one word. In fact, it works better as a phrase so for this specific post you’re reading the keyword. In other words, what you want to be found for on a search engine, is ‘rank higher on Google’ – researching this specific keyword brings up 390 of searches a month as opposed to the keyword being ‘rank higher’ which is too specific and receives 590 searches a month. To be honest I was shocked by these low numbers. Let’s just go with these numbers?! 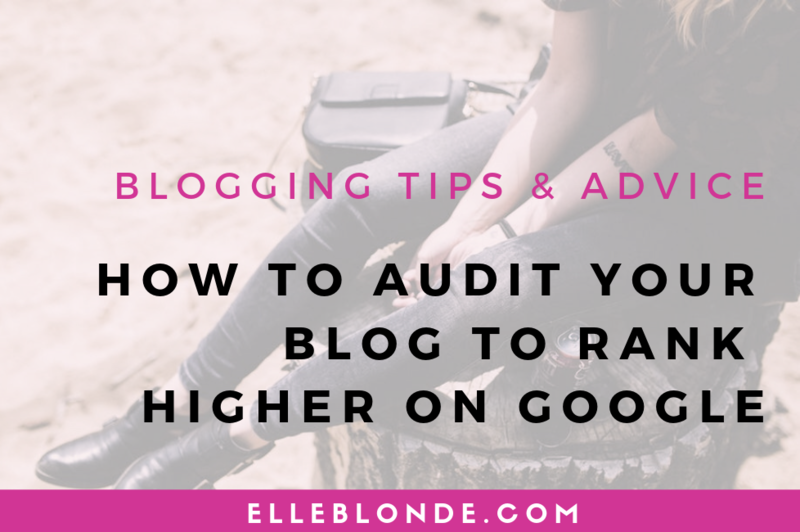 Let’s look at the blog post we are auditing together. We’re going to use this one you’re currently reading. See the readability is red and orange for the keyphrase. Let’s fix this. Before I start I always run a post through Grammarly. This is a spellchecker software which is so sophisticated it is able to read your writing like a human. Once I’ve removed any spelling and grammar errors I then move on to fixing the readability. The reason you can’t afford to have silly spelling and grammar errors is that search engines like Google much prefer content which is virtually error-free as opposed to a rushed job with lots of errors. Google is a service, as are other search engines, and their aim is to provide the most correct and accurate results for the things people search for. Plus who wants careless typos? It lessens your validity as an authoritative figure in your field. You don’t want that now do you? 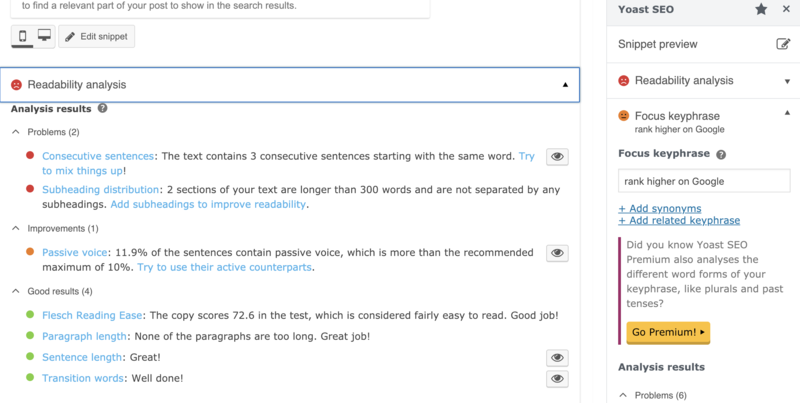 Checking the readability we need to add some subheadings to break the post down. Some sections are larger than 300 words so we need to break these down further with sub-subheadings (we use H4 for the side). After this, we’ve got 3 sentences which all start with the same word. Click on the eye and it’ll show you where this error is. Simply change the sentence structure to stop sounding too repetitive. The reason we make sure that the readability is on green is to make it easy to read for anybody who lands on our page. Once we have made changes and the light is green we can move over to the SEO side. We then add the keyword. 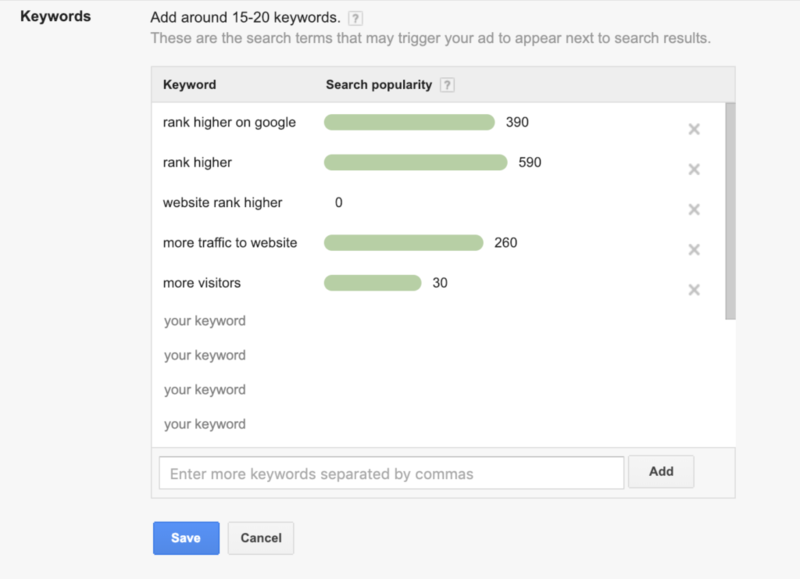 We’ve chosen the keyword (or phrase) for this post to be ‘rank higher on Google‘. So we add this to the keyword box and it’ll give us a score like so. We can see here that the title is too long for search engines so let’s make it the right length and add some metadata which search engines show potential readers. This is your chance to sell your post. Do make sure that you use the keywords in the metadata! I’m going to show you how to fix the following red dots in the sections below. Because search engines can’t ‘see’ the images in your post sometimes they don’t know what your image is shown. The best way to help rank higher on Google is by firstly naming all of your images properly before uploading them to your site. Include the keywords or phrase in the name. We would use ‘rank higher on Google’ and then adding ALT tags for meta and SEO data. This is also important if your image doesn’t load, your readers can read what the images are supposed to show. It is also really good for those with visual impairments on your site. Again make sure that you’re adding the keyword to your ALT tags, at the beginning where you can. You’ll see we’ve used ‘How to rank higher on Google’ as the start of the ALT tag, this is the phrase we have seen used often when searching for answers for this topic. Every post should internally link to at least 2 of your older posts that are related. When you link to a blog post, go to the older blog post that you’ve linked to and link back to the new post. You’re creating a spider web so to speak, where everything on your site is linked one way or another. Get into a habit of going back and including links to your new posts in your older posts when you publish them. Make sure no post is left as an orphan post. That is; a post with no internal links. Top tip: When highlighting a phrase, type in a word and WordPress will give you a list of posts containing that word. Linking properly internally and by not using the anchor ‘click here’. Which by the way you should never do! Instead, use keywords to signalling to search engines that your website is all pulled together and relevant. This way you can also drive more traffic to older posts. The way that I look at it, if you’re not getting at least 1 view on each blog post you’ve ever published a day (that’s optimised) then you’re doing something wrong. Why write content that’s only seen for a short period of time when published and then not viewed again after? The more you older content is viewed, the more relevant Google (and other search engines) think your site is, thus pushing you higher up the rankings meaning more organic and direct traffic. Link out to a minimum of one link per post too. This is a great practice to get into both internal and external linking as this grows your search engine credibility. Either weekly or monthly check the broken links on your site by using a website like Broken Link Check, where they find all instances of broken links. You can then either remove these links or amend them to working links. This again is good practice and the less broken links that you have the more of an authoritative source your site is viewed as. This one is pretty simple, make sure that you always and I mean always add a Category for your post. Try and keep them generic and bulk content into a maximum of 5-7 different categories. For example, I use Food & Drink, Travel, Lifestyle, Business & Blogging Tips and Beauty. 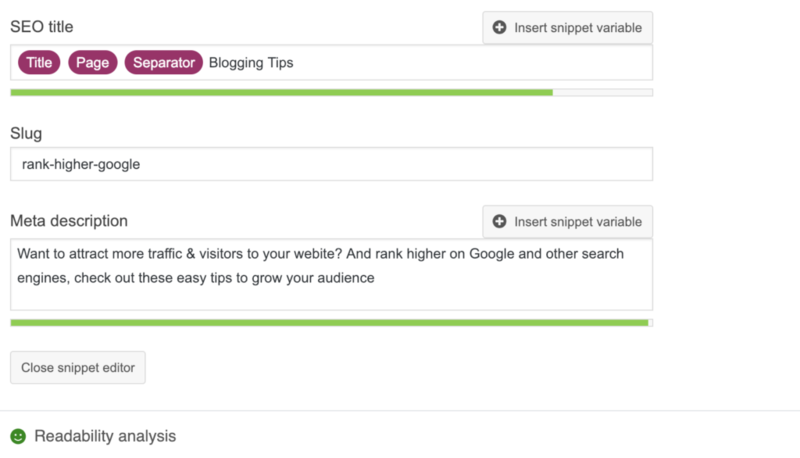 This allows search engines and your audience to see similar posts on similar topics.se Increasing reader on page time as well as making your ‘spider’s web’ of your site more coherent. As for tags, try and use a group of between 20-50 tags you pick from. I suggest using no more than 4 tags per post. So, for example, this post would be tagged under; Blog Tips, Blogging Tips, Business Advice. Once you’ve created your content, made sure it is fully SEO ready on Yoast with readability and keywords. Added images with appropriate names and ALT tags, added your categories and tags to your post then you should create an image that you can Pin to Pinterest to drive more traffic to your site. You can do this easily in Canva. I like to create two images, a larger image to post at the bottom of each post and a smaller horizontal rectangular image to sit in the middle of the post. These usually have different captions on. You can read all about how I grew my audience over 1,000% on Pinterest in one month. Pssst to save you reading its Tailwind, but that post tells you how I use it. Once you’ve added an image to pin, then you can press PUBLISH. But it’s not all over yet there. In fact, it’s only the beginning. You should stick to the 80/20 rule. 20% of the time you create content, 80% is spent promoting it. Crazy, but you need to push the content you’ve already written. 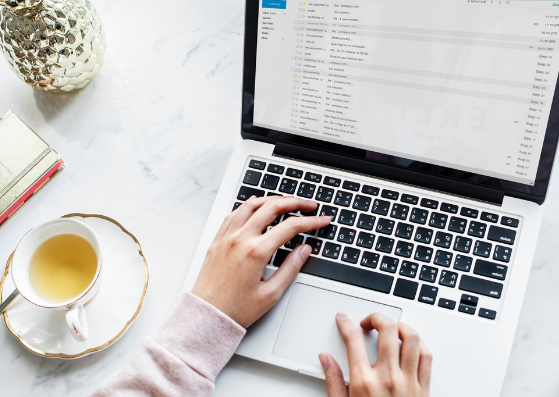 The first place to share your new blog post is on social media, if you’re a fan of automation there are plenty of automated plugins for sharing your post you can download, alternatively, if you wish to do this manually then make sure that you’re pushing your links. The next place you can add your new post to is a website called Mix (formerly StumbleUpon), this website randomly generates posts users may be interested in based on previous selections of their interests. You can discover new websites on mass here. We generate around 12% of our monthly traffic just from Mix. Finally, the last place you are going to publish your link to, and the most important place is to Google Search Console (formerly Webmasters. This is super important. Imagine how many new pages are being published daily and Google has to scan and pick them up, most of them are missed. With Search Console, every time you post a new post or update an older post add the link to be indexed. It’s simple just paste the URL in the top bar, press enter and then ‘request indexing’. This gives Google a little heads up that there’s a webpage there and it helps to create that all-important spider’s web image of your website. 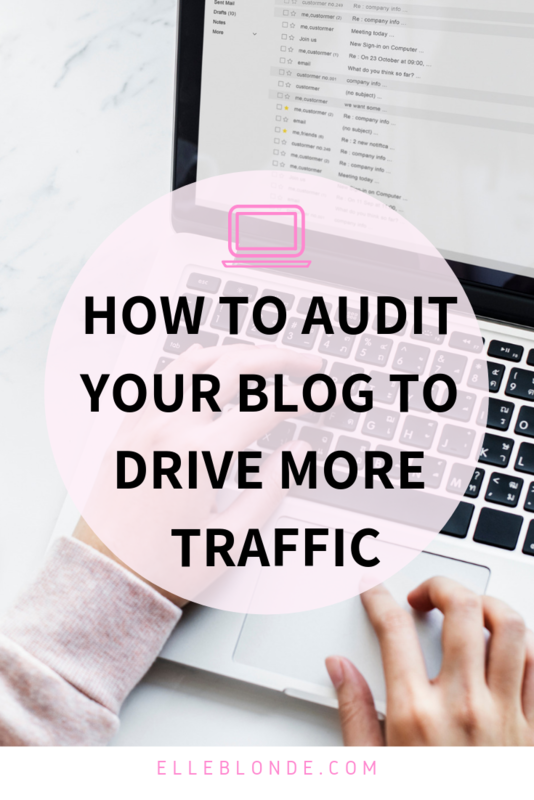 With each and every single post you audit and publish in the future follow these simple checks to improve the SEO of your posts so that your efforts are recognised and your website is being found by people searching on Search Engines. If you have any other tips or have used these tips and seen an improvement do let me know below! Previous articleThe Sugar Factory, Las Vegas.